There’s nothing quite like relaxing on your deck on a warm day, whether you’re in peaceful solitude or among those you love. Odd Job would like you to live this dream. This is why we’re offering professional deck maintenance services – cleaning, repairs, refinishing, and resurfacing. We’ve assembled a specialized team of deck technicians with the experience and talent to turn any old deck into a backyard paradise. After years of exposure to our country’s seasons, even the most beautiful deck is going to show signs of age and wear. The boards will split, the nails and screws will rust, and the supports will begin to rot. What was once the perfect deck will soon become unsightly and unsafe. Don’t fret – no matter how bad it is, our team has seen much worse. They’ll come to your home and carefully assess the damage before developing a plan of action to restore its beauty and functionality. Are certain parts of your deck starting to rot or wear out? We’ll remove and replace deckboards, spindles, treads, and railings, equipping your deck with newer, perfectly functional hardware and leaving it better than ever. Are key parts of your deck starting to fail? We’ll reinforce the ground beams, slabs, walls and stairs so that it will last for years to come. 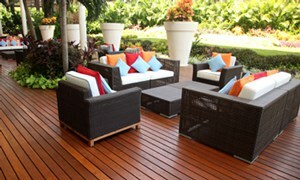 Why not accessorize your deck and impress your friends? We’ll install upgrades like chamfer strips, anchor bolts, dovetail anchors, and expansion joints? We can build concrete additions to your deck as well – walls, columns, stairways, slabs or an accessibility ramp. Harsh weather isn’t the only factor taking a toll on your deck. Another is human activity. Stains, scuff marks and wear will inevitably surface after a certain number of backyard parties. No worries – our deck maintenance team has a unique method of power washing that employs only water and 100% non-toxic, biodegradable solutions that are guaranteed not to damage the surface of your deck. We’ll wash down the entire structure – railings, steps, pergolas and everything else – to keep your backyard paradise looking as fresh as possible. There are times when power washing isn’t powerful enough to achieve the crisp surface you desire. Our deck maintenance team will refinish your deck and leave it looking even more gorgeous than it did when it was built. After all of the necessary repairs and maintenance, we’ll sand, sweep, wash and repeat until the surface is ready to be stained and sealed. 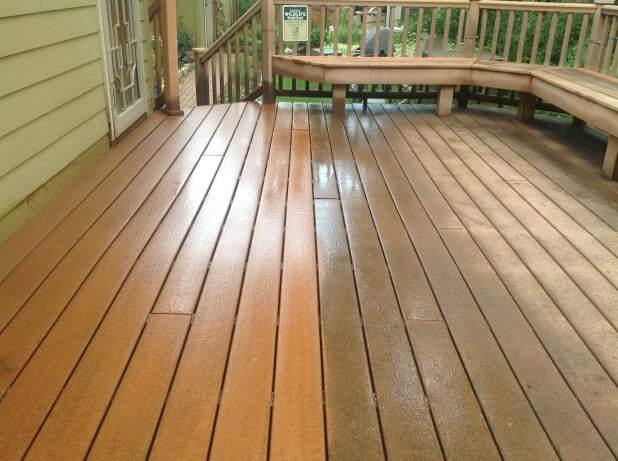 We then re-coat, re-seal or re-stain and seal your deck, leaving results like this. Sometimes even a gorgeous new finish isn’t enough, and the entire surface needs to be replaced. Odd Job has you covered. Our deck maintenance team will remove the surface decking and inspect the structure for any necessary repairs. After that, we’ll install new decking in either the same pattern or a new one you prefer. We can even add benches, privacy walls and any other addition that you feel flows well with the updated surface. 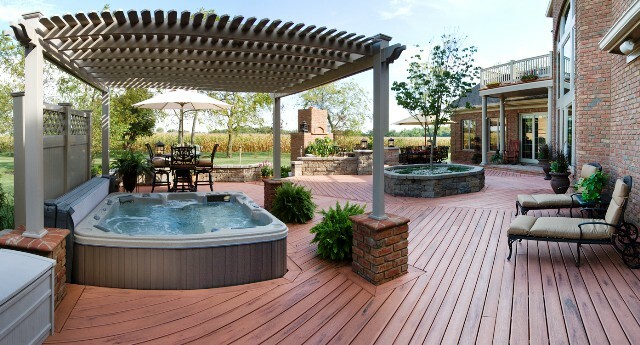 By the time we’re finished,your deck will look as if it was just built! 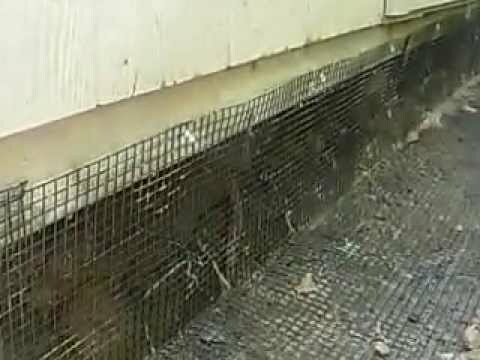 Have raccoons made themselves at home under your deck? It’s a frustrating story we’ve heard repeatedly: no matter how many times you remove them, they always seem to find a way back. Don’t call an exterminator – such solutions are ineffective, short-sighted, and illegal. Call us – our deck maintenance team has animal-proofed literally dozens of decks. They have experience blocking off everything from front porches to rooftop decks and just about anything in between. We will carefully inspect the structure for any damage caused by the animals and take care of any necessary repairs before developing a long-term solution to the issue. Book a Handyman today and start loving your outdoor space again!